Grapevines that show signs of potash deficiency will have yellowing leaves near the outer margins. This will especially hold true during the summer months on a mature plant. Severe potash deficiency will reduce the plant's vigor, growth and fruit yield. According to Ohio State University, potash can be applied through a foliar spray or into the soil around the grape plant. The foliar spray is a temporary fix, while adding the potash to the soil will give sustained nutrients during the growing season. Conduct an annual soil test for the grapevines in your vineyard. Contact your local agricultural extension service to learn their particular process and procedures. Soil test results will take three weeks to six weeks. The analysis will have detailed recommendations for all soil nutrients and pH levels. Add the recommended amounts of potash to the grapevines. Grapes are extremely heavy users of potash. 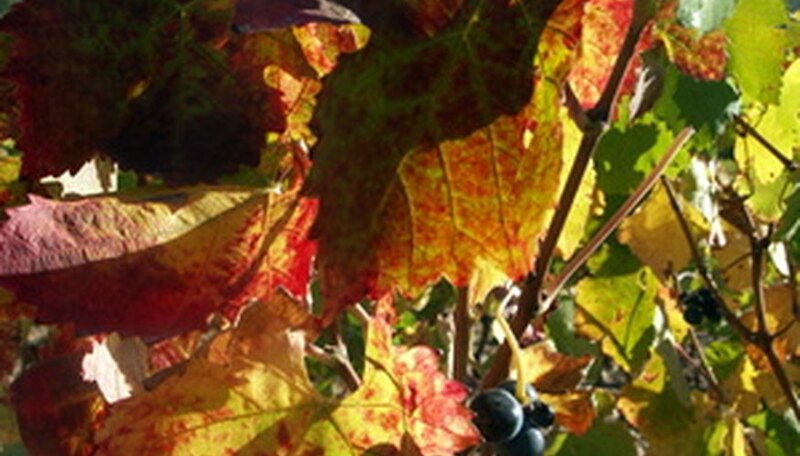 According to West Virginia University, all bearing grapevines must receive a yearly dose of high-level potassium in either the chloride or sulfate formation. Spread one tablespoon of high-level potash fertilizer around each bearing grape vine. The actual amounts may be more or less if an annual soil test is conducted. If no soil test was performed, West Virginia University recommends this amount per plant per year. Apply a foliar spray of either potassium sulfate or potassium nitrate as a temporary fix to the yellowing leaves on the grape vine plant. Follow all label directions of the potash concentrate. Various potash concentrates will require different dilution rates for a spray application. Potassium does fix itself in the soil, so a granular application must still be made to the soil around the plant. Consult your local agricultural extension service for any bulletins concerning grape plant growing and fruit cultivation for your area and climate. There are various types of grapes that will react differently to the widespread soil and climate conditions of this adaptive plant.